For less than the price of a cup of coffee each day, you can enjoy the same luxurious comfort as sleeping in a 5-star hotel. Why Shop Mattresses at Belfort? Stop in today. Give us 5 minutes of your time and we'll show you how to get a great night's sleep every night. This year you’ll spend 120 days in bed. Are you sleeping on the right mattress? Getting a good night’s sleep can set you up for a successful and happy day, each and every day! Be sure that you’re spending your sleeping time on the right mattress. Speak with a sleep specialist to help you determine your sleeping position. You could be a side sleeper, stomach sleeper, back sleeper, or multiple position sleeper and different mattresses and pillows may be better suited to your sleep style. Find the comfort level that fits your sleeping style such as Firm, Plush, or Ultra Plush mattresses. 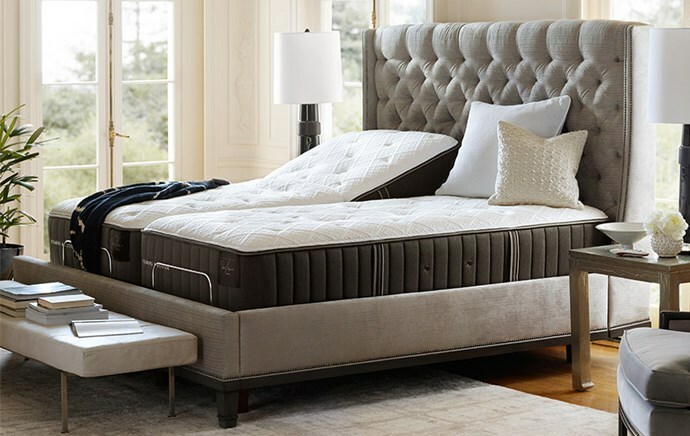 You deserve a good night’s rest and we’re here to provide you with the mattress options to help you wake up rested and live a healthy lifestyle. Let our professionals educate and guide you in choosing just the right mattress for you. In the end, it’s one of the most important purchases in your home because better sleep means better health. 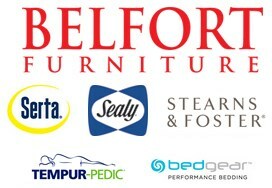 Belfort Furniture's mattress department offers over 60 brand name mattresses on display, better sleep shop prices every day, free white glove delivery, set up, and removal of old bedding. View our current special offers and promotions for mattresses and mattress sets. We beat sleep shops and department store prices EVERYDAY!